I am delighted to be partnering with JORD once again so be sure to read to the end for a very special giveaway! The winner of our last giveaway was over the moon with her JORD watch (she also chose the Cassia!) so we are especially pleased to be able to host another JORD giveaway for our followers!. Soon my mother and blogging partner, Lynn, will be celebrating a very special birthday (she doesn't like me to talk about her age so I will spare you the exact details!). She has long admired JORD’s selection of unique watches and loves my Cassia so for her special day I wanted to give her the gift of her very own beautiful JORD Wood Watch. JORD Wood Watches have a unique style all of their own. I love my watch with it's eye catching rose and walnut design but I knew that my mother would appreciate a design that was more classic. I chose the Frankie Zebrawood and Champagne model as I knew that she would love its elegance and minimalism. The Frankie comes in seven colorways but the beautiful champagne face and sleek zebrawood strap stood out to me as being effortlessly chic - just like Lynn! Watches as beautiful and well designed as the JORD collection usually carry a high price tag however JORD watches are a beautiful and luxurious gift at an affordable price. The Frankie Zebrawood and Champagne 45mm ultra-thin quartz watch is just $189 (GBP £160) which means that you can give a super luxurious and unique gift without breaking the bank! When giving a gift for a special occasion how much more special would it be if it were engraved? One of the features that attracted me to JORD watches initially was the customization aspect. I had the Frankie watch engraved with my mothers name to give it a totally personal feel. JORD are able to customize most of the watches in their collection. Backplate engraving and presentation box engraving are available in block and script or you can even upload a custom design where your handwriting, imagery or logo can be precision laser engraved, making your purchase truly one of a kind. 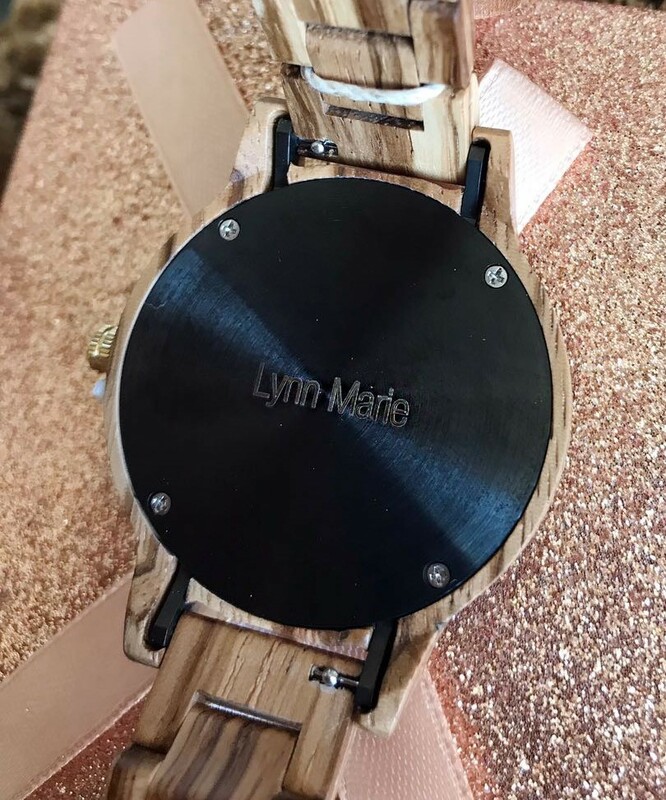 I can’t wait to present Lynn with her beautiful, customized JORD Wood Watch for her birthday. I know she’s going to love it! JORD will ship your watch to the USA, UK & WORLDWIDE! It's so easy to enter! Simply click the link below, enter your email address & pick your beautiful watch! Good luck everyone! I love my beautiful JORD Wood Watch and I know you guys will too!